In the present time the Banking Sector is under severe turmoil, as NPAs are mounting day by day; while there are numerous consultants & professionals working with the companies to deal with stress, there is hardly any intellectual & technical backing given by such experts to Bankers, Analysts, Auditors & Investors. This book helps understand the core basis of such ever evolving & creative techniques used by Corporates to project a Rosy picture in an attempt to hide the true facts & figures of an entity. This book is a master guide of sorts, decoding the various tricks in the hats whereby the creative accounting practices are exposed & explained, thereby helping Bankers, Forensic Auditors, Analysts & Investors in bringing out the true state of affair of an entity, in a simplified step-by-step approach covering each aspect of the financial statements in detail with case studies & examples of how an entity moves from one financial statement to another, thereby empowering the reader with the knowledge to analyse not only the financials at hand but also training them to be a financial master, permanently. Through these case studies & the step-by-step guide the author has explained what aspects are thrown in the face of the reader while sneakily masking the real data behind numbers. The ideology is to move from firefighting & post-mortem exercise to a preventive exercise, as the old proverb says ‘A stitch in time, saves nine!’, thus enabling a system of detecting Early Warning Signals rather than realising when its too late. 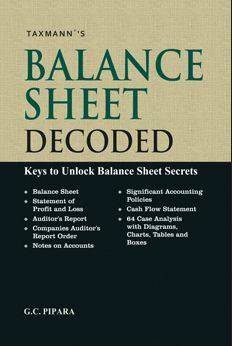 There are 5 keys, covering aspects of Balance Sheet, Profit & Loss Accounts, Significant Accounting Policies + Notes to Accounts + Significant Accounting Policies, Auditors Reports & Cash Flow Statements, thereby explaining in detail with multiple examples in a step-by-step manner each critical items with its evaluation criteria. This book, can & will help all Bankers, Forensic Auditors, Analysts and likes to detect Early Warning Signals & Red Flags in such entities, which would in turn be sufficient to safeguard the lenders / investors in time.